I was very impressed with the direction Coach had taken over the past couple of years and considered it one of the better labels in the moderately-priced range (except for their over $1000 bags that defy logic). Then they go and design something like this! Except for its' classic shape and practical storage features, the Coach Tattersall Graffiti Domed Satchel is all wrong. I mean WRONG! 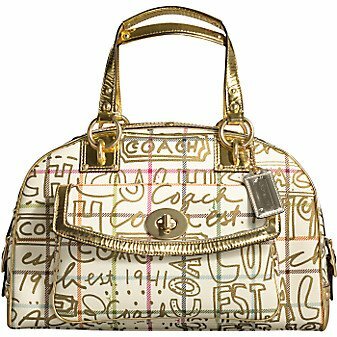 The tragic graffiti-print fabric exterior and tacky metallic leather trim make for one stunted handbag. Plus it's priced at $498. Are they kidding me? I wouldn't pay 5 pennies for this thing let alone $500. My advice to the design team at Coach is to stick to classic beauties such as the Penelope, Spectator and Madison collections and leave the ridiculous hag bags to D & B or Juicy Couture. Another thing, I think it’s more for an invite to a younger crowd. They have wonderful bags for older women but this bag is great to feel a younger crowd feel included. Coach must have been wanting to enlarge their clientele.